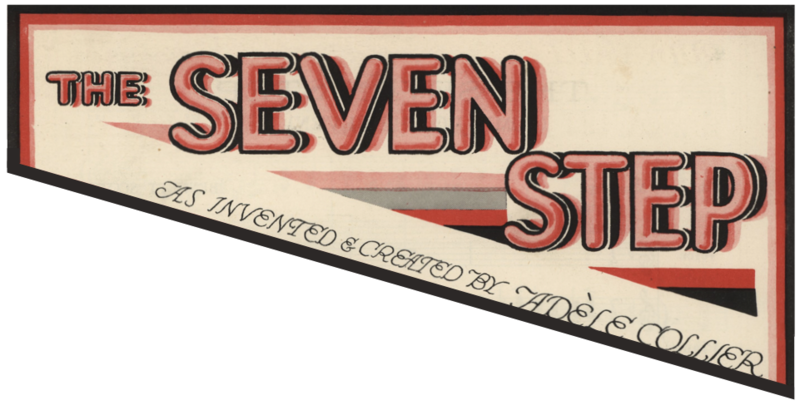 The Seven Step is a dance in 7/4 time invented by Adèle Collier in 1930 [AC30]. According to one source, it was created when Collier realized that the new fashion of long dresses would necessitate dancing with "dignified, graceful movements" [CE30]. The Walk: Starting Lead's right foot, back the Follow four steps, closing on the fourth step (1, 2, 3, 4), then back the Follow three steps, closing on the third step (5, 6, 7). Repeat on the opposite foot [AC30, MG30]. 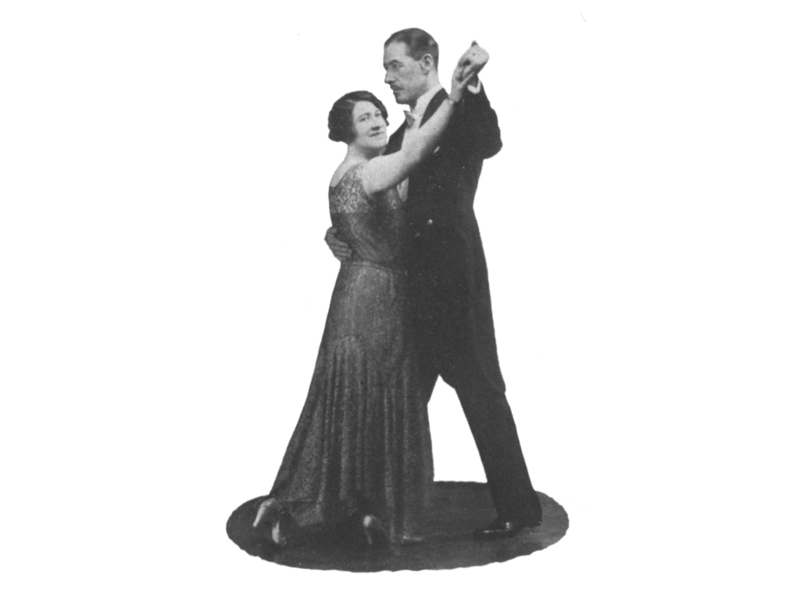 The Natural Turn: A full right-turning waltz, starting Lead's right foot, Follow backing, and holding closed without weight on 4 before starting the second half. Having an even number of weight changes, it can be repeated directly [AC30]. The Reverse Turn: A full left-turning waltz, starting Lead's left foot, Follow backing, and holding closed without weight on 4 before starting the second half. This can also be repeated directly [AC30]. The Side Step: Lead facing out, starting Lead's left, step side left (1), close without weight (2), forward right (3), side left (4), back right (5), side left (6), and close with weight (7). This can also be repeated directly [AC30]. The Swing Step: The steps aren't entirely clear, but it has a fascinating rhythm of slow (1, 2), quick (3), quick (4), quick (5), slow (6, 7) [AC30]. "The Seven Step (Come, Do the Seven)" by Bennett Scott is the only known piece of music for the dance [AC30]. I'm unaware of any recordings of it. One source notes that "it is played at approximately the same tempo as the slow foxtrot, and has a most attractively lilting rhythm" [CE30]. AC30 — Adele Collier. (1930). The Seven Step. London. MG30 — The Manchester Guardian (pub.). (1930, August 5). "News for the Dancer." The Manchester Guardian (London, England). CE30 — Henri Pickard. (1930, October 4). "London Dances." The Enquirer (Cincinnati, OH). If you or your community is interested in learning the Seven Step, .